God himself knows how much we both love the country. I’m a country girl through and through… But one advantage that I can boast of “in the city” is rare lack of Internet and home wi-fi networking. 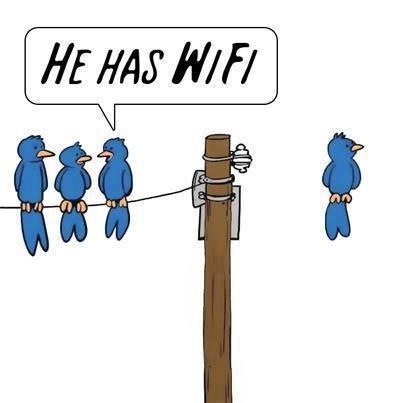 My Dad has continued issues and spotty service… He’s the true tech guy and has all the knowledge I lack… But for all the know how and equipment – if you have no wi-fi, you are sunk. So D, here’s a smile… For whenever you get back to Internet land in a longer than two minute stretch! I thought of you today and had to laugh. Ahhh yes, It’s either the dropped internet connection needing a reboot of the router or, the phone service just ups and quits. Gotta keep smiling tho! That savvy little bluebird made me smile.